I mentioned it was Baby Strawberry's first birthday a couple of weeks ago (can you believe it?) We of course had lots of fun and lots of yummy food. With my little man, I had a big party at the house, fed everyone, made cute/high maintenance cupcakes, and loved it all! This time around (after another big birthday complete with Orange Creamsicle Cupcakes) I thought something simpler would be better. Since her birthday is right next to two of her cousins', we had an easy get together at the park with pizza and salads. I made vanilla bean and red velvet cupcakes that night and will post those next. Then we decided to do a simple dinner, just my family and my "sister", and celebrate together. For dinner I made roasted chicken, mashed potatoes, and green beans. Kara brought cornbread and an amazing salad with locally made meyer lemon olive oil and strawberry balsamic vinaigrette! So I confess the simple dinner took a lot longer than I thought it would- it always does (big thanks to my mom for letting me mess up her kitchen all day and helping clean it all up!) But we all enjoyed it and Kara went into labor the next day, so I think the food did it's job! For dessert I made Martha Stewart's Boston Cream Cupcakes. 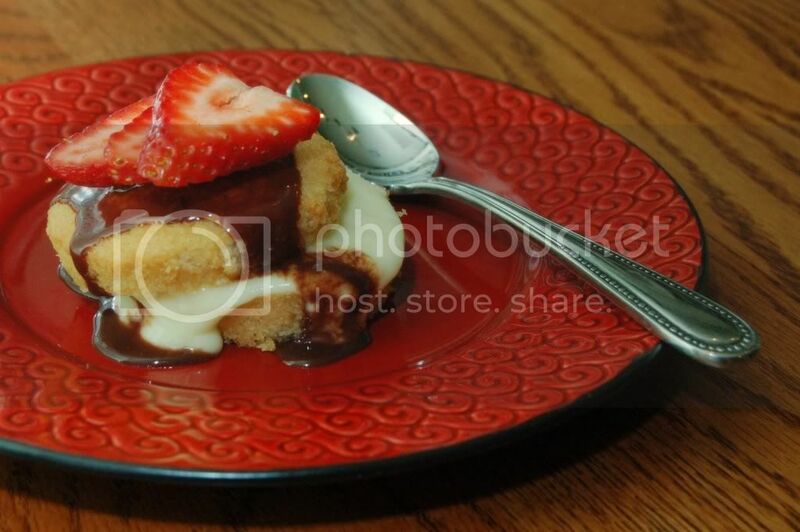 I'm not sure why I was crazing Boston Cream Pie (since I've never actually had it!) It probably has to do with my affinity to pastry cream. This recipe was very simple to make, just a ganache for the topping, a pastry cream for the filling, and a quick, easy cake. Baby loved it, of course (she has a huge sweet tooth!) There are three components to make but each is very simple and doesn't take much time. I worked on each them between other steps for dinner and didn't hardly notice the time to make these- don't be intimidated! *note- My family has been (rightfully) accusing me of underbaking things so I tried to follow these directions exactly. However, I thought the cupcakes were just a minute overdone and a tiny bit dry for that reason, so I would be sure to remove them as soon they get a hint of color and their lovely smell wafts through your kitchen! Preheat oven to 350 degrees. Butter and flour standard muffin tins. Whisk together flour, baking powder, and salt in a small bowl. Warm milk and butter in a saucepan over low heat. Beat eggs and sugar with a mixer on high speed until thick and pale, about 5 minutes. Beat in dry ingredients. Bring milk and butter to a boil. With mixer on low speed, add milk mixture to batter, and beat until smooth. Add vanilla. Divide batter among muffin cups, filling each halfway. Bake cupcakes until light gold (just barely starting to color), about 15 minutes. Let cool in tins for 10 minutes, then transfer to wire racks. Let cool. Using a serrated knife, cut each in half horizontally. Spread 1 tablespoon vanilla cream (I used more) on each cupcake bottom. Sandwich with top. Spoon glaze over each, and serve immediately. *note- I prefer Dorie or Ina's pastry cream and will use my favorite "slightly lightened" version next time I make these. Whisk yolks until smooth. Mix sugar, cornstarch, and salt in a medium saucepan over medium heat. Add milk in a slow, steady stream. Cook, stirring, until mixture begins to bubble and thicken, about 5 minutes. Pour 1/3 of milk mixture into yolks, whisking constantly. Return mixture to saucepan, and cook over medium heat, stirring often, until thick, 2 to 4 minutes. Stir in vanilla. Pass vanilla cream through a fine sieve into a bowl. Press plastic wrap directly on surface. Refrigerate until cold, at least 1 hour, or up to 2 days. Bring cream to a boil in a small saucepan. Remove from heat, and add chocolate and corn syrup. Let stand for 5 minutes. Whisk until smooth. Transfer to a bowl, and let cool, stirring often. Use immediately. Baby Strawberry was so darling with her birthday baby and cupcakes. She was the most cooperative one year old cake eater we've had yet! I forgot to mention how yummy the cupcakes were...silly me. Everyone, not just Baby Strawberry loved 'em. Yummy! 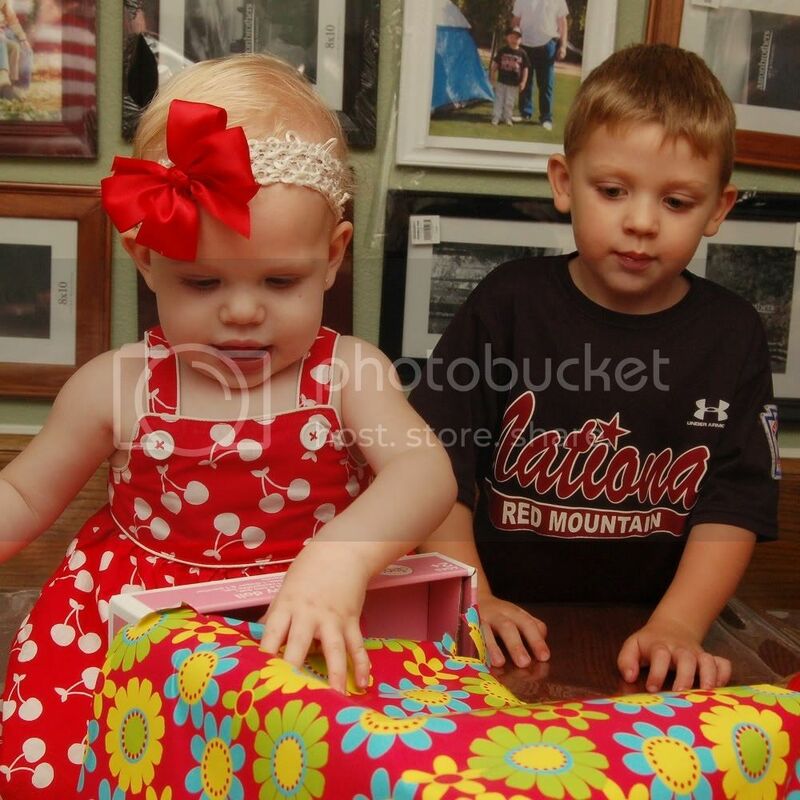 And she is absolutely adorable, I love her dress! This is all so adorable. 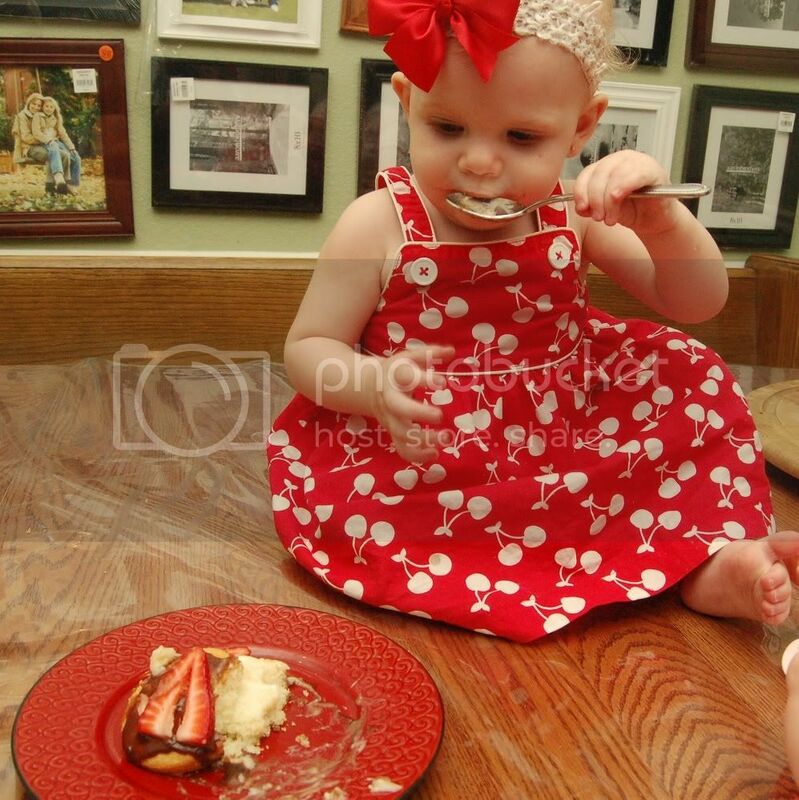 Your little strawberry is a charmer, especially in her cherry dress! What a lucky baby she is, to have such a lovely treat for her big day. SO CUTE! I can't wait to try these cupcakes for Jesse. Boston cream anything is his favorite. Oh my....adorable and yummy all at once! Baby Girl is just precious! Happy 1st BDay to her! AND wow those cupcakes look GOOD! DELICIOUS! 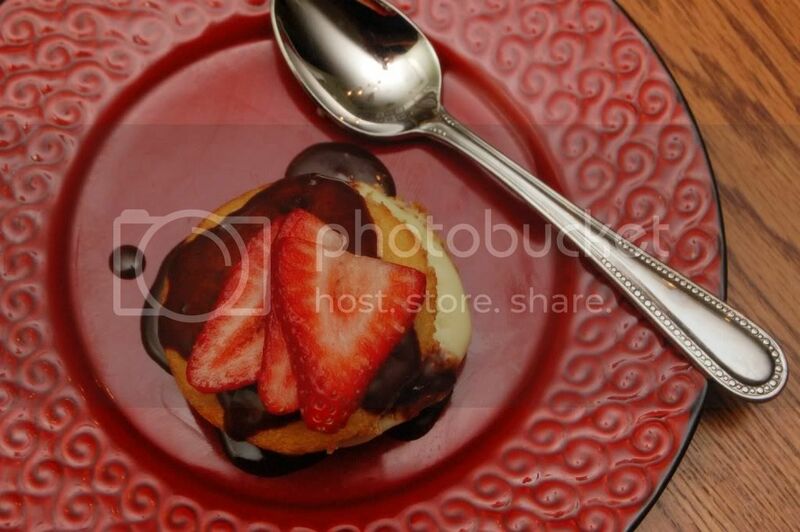 Oh yes, the Boston Cream cupcakes look fantastic, too. Yum, what a delicious little dessert. Baby Strawberry is adorable! And so are your cupcakes. Baby Strawberry is adorable, so cute in that darling dress. Happy Birthday to her. The cupcakes sound perfect for the occasion! I wanna pick up Baby and squeeze her till she pops. She is too adorable! Happy birthday baby Strawberry! It's so fun to see your baby all grown up at one year! As usual, the cupcakes look wonderful.